Place Prosciutto onto baking paper into pre-heated oven (180°C/160°C) and bake for 8-10 minutes until crisp. Break Prosciutto into large pieces. Preheat a lightly greased chargrill pan on high. Brush baguettes slices with olive oil – place onto pan turning every 2 minutes until bread is golden and charred. Put aside to cool down onto a paper towel to drain. Bring to boil, reduce heat to medium. Simmer for 4 minutes and refresh under cold water. Peel the eggs and let sit. Wash and cut Baby Cos lettuce in half and arrange into salad bowl. 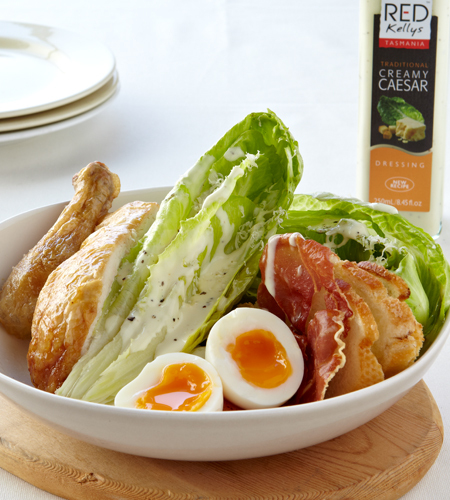 Tuck the bread slices together with the Prosciutto alongside the lettuce together with the cut egg. 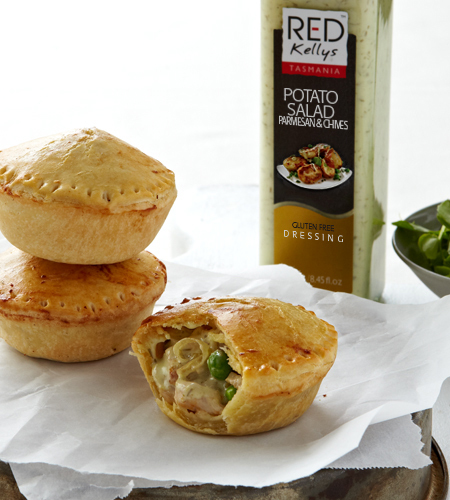 Cut the roasted chicken into 4 pieces, place into salad bowl, sprinkle with parmesan and drizzle with Red Kellys Caesar dressing. Tip: You can roast your own whole chicken or purchase a roasted chicken from your local retailer.